When I was little, I remember my mom always had to remind me to sit up straight and stand up taller with my back straight because I always tended to slump or slouch a little since it was more comfortable. Thankfully, it was a habit I got out of and the Pilates class I'm currently taking has really helped me become even more aware of my posture when standing or sitting at work, which I do for hours at a time at work. I just want to point out that it's important for everyone but even more important for someone petite like me because how you carry yourself really makes a big difference with how people end up perceiving you. Standing straighter can make you seem much taller than you actually are and helps to exude confidence. Pilates has taught me to try to be conscious of pulling in my ribs to keep my spine in a straight line, which also helps you appear leaner. I received an eye opener a few days ago when I realized that going to the gym and keeping in shape actually makes a big difference in recovery because A and I visited Bounce It! 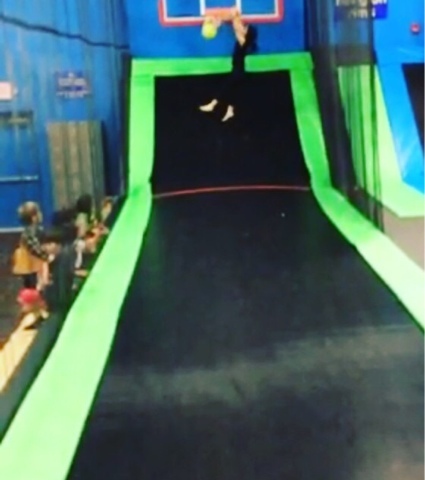 over the weekend, which is a large indoor trampoline space for a friend's birthday, and luckily for me, I only felt sore briefly afterwards, while A is achy all over and it's been two days already since we went. He used to work out regularly but has not kept it up since he's been busy with school work but is now looking to get started again (which means less cooking for me and eating repetitive food but more on that next time). But of course, what you put in your body is as important, if not even more. Dominique Ansel's famous Cronuts and Cookie Shots are temptingly delicious but he also offers healthier fare like a Broccoli, Spinach, and Mozzarella Panini that I tried to recreate at home. 1. Bring a small pot of salted water to a boil; cook broccoli until just tender, about 3 minutes. 2. Drain; place in ice-water bath. Drain; pat dry. 3. Meanwhile, heat olive oil in a saute pan over medium heat. Add garlic and spinach; let wilt, stirring occassionally, about 5 minutes. 4. Stir in salt, pepper, and chili flakes. 5. To assemble each panino, layer 3 tablespoons of the sauteed spinach, 5-6 broccoli florets, and 2-3 slices mozzarella on bottom slice of bread. 6. Drizzle a bit of olive oil on interior of top slice, and put on top. 7. Lightly oil a panini press or grill pan (I used my George Foreman grill). Grill panini until center melt and edges get toasty, about 4 minutes per side. (If using a grill pan, place pan on top of paninin to weigh them down.). I didn't have a grill pan at the time so used my George Foreman grill as a substitute, which worked fine. It was really delicious, especially with fresh mozzarella, and A didn't miss having any meat! I've been on a brief hiatus with a work trip to Hong Kong/China the past week and a half and can't wait to be back home! Leaving you with the fortune cookie quote, "To understand is hard. Once one understands, action is easy."